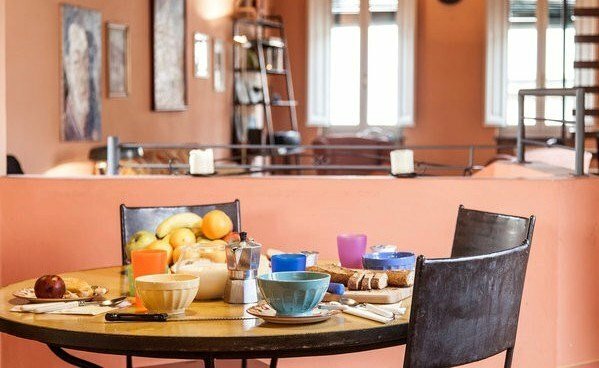 Apartment/ Attic (70 m2) of an ancient palace in the historic centre of Lucca. The city is famous for the 16th century walls that encircle it, as well as for its Duomo and its other beautiful churches. The apartment is bright and its interior has been renovated (except for the condominium access stairs) and enjoys a pretty view of the city. Public payment parking nearby. Reachable from the train station doing 2km by feet in the historic centre. LOFT - spacious living/dining room (TV) with kitchen corner (oven, freezer) and sofa bed, lumber-room (washing machine), and service bathroom. A wooden staircase leads to an open overhead gallery with a double bed, 1 bathroom with shower. Comfortable furniture. Central heating. Lucca is a place that you can just walk around and discover and enjoy. It is strategically positioned, really close to Firenze, Pisa, Pistoia, Livorno and the beaches and far from the crowds. It has many things to offer to the guests as you can visit the city both by foot or cycling into the walls. There are a lot of place to see in the beautiful town, first of all the ancient walls, the Amphitheatre square and not least the Torre Guinigi. In a few kms from Lucca you will also find beautiful villas like Villa Reale, Villa Mansi or Villa Torrigiani. The Lucca area offers also a lot of interesting naturalistic places like Garfagnana, Valle del Serchio or Piana di Lucca. For those who wish to swim in the sea, the coastal strip of Versilia, from Forte dei Marmi to Torre del Lago Puccini, offers more than 20 kilometres (12 miles) of beaches, parks and splendid countryside. Most beaches can be reached from Lucca by car in 30 to 45 minutes. It could be also an ideal point to tour around the famous Cinque Terre. The area is easily reachable by car with the A11 super way Firenze-Pisa Nord (called also Firenze -Mare) exit Lucca east (11 km). From Genova you can use the A12 Genova- Rosignano. The railway station, that is not far from centre, links the city with Firenze and Pisa with hourly connection. From Firenze then you can reach all other Italian Cities.